Kepler's geometric model of a heliocentric planetary orbit is summed up in his three well-known laws of planetary motion. According to Kepler's first law, all planetary orbits are ellipses which are confocal with the sun and lie in a fixed plane. Moreover, according to Kepler's second law, the radius vector which connects the sun to a given planet sweeps out equal areas in equal time intervals. Figure 17: A Keplerian orbit. Consider Figure 17. is half of an elliptical planetary orbit. Furthermore, is the geometric center of the orbit, the focus at which the sun is located, the instantaneous position of the planet, the perihelion point (i.e., the planet's point of closest approach to the sun), and the aphelion point (i.e., the point of furthest distance from the sun). The ellipse is symmetric about , which is termed the major axis, and about , which is termed the minor axis. The length is called the orbital major radius. 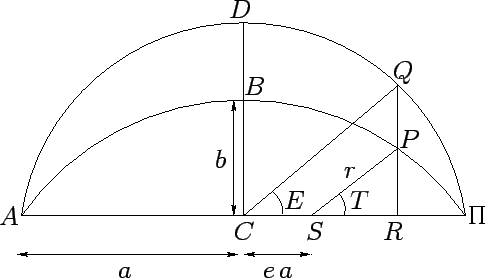 The length represents the displacement of the sun from the geometric center of the orbit, and is generally written , where is termed the orbital eccentricity, where . The length is called the orbital minor radius. The length represents the radial distance of the planet from the sun. Finally, the angle is the angular bearing of the planet from the sun, relative to the major axis of the orbit, and is termed the true anomaly. is half of a circle whose geometric center is , and whose radius is . Hence, the circle passes through the perihelion and aphelion points. is the point at which the perpendicular from meets the major axis . The point where produced meets circle is denoted . Finally, the angle is called the elliptic anomaly. is an angle which is zero at the perihelion point, increases uniformly in time, and has a repetition period which matches the period of the planetary orbit. This angle is termed the mean anomaly.